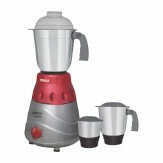 Amazon India selling Inalsa Jazz Dx 750-Watt Mixer Grinder with 3 Jars (Grey/Maroon) Rs.1889 only.. You can follow the below steps to buy this product at their deal price.Keep Visiting dealsheaven.in for more Best offers ,hot online deals, promo code, coupons and discount . Product is equipped with an over heat safety device which operates as soon as motor is overheated. When this safety device operates the product stops working. Please press re-start button after some time as soon as the motor is back to normal temperature or cause of overload is removed and the product will function normally.